Master Wan Ko Yee, master of Buddhism and art, yesterday made Chinese art history when his painting was sold for the highest price ever by a living Chinese artist. His painting,“Venerable Da Li Won”, broke the painters own record when it sold for NT$72 million, or US$467 per square inch, an official from the auction said. “Originally, we estimated that it might be sold for about NT$30 million. However, the bidding went higher and higher. Though the final selling price was beyond what we had expected, it wasn’t really much of a surprise because Master Wan Ko Yee is very influential in the religious world and his painting is outstanding”, said Thomas Fan, an official at the Chinese Painting Department of Unique Art Collections International Co.,Ltd. Fan said that the bidding for the painting started at NT$18 million and that a British art collector and art merchant, Mr. Naylor, made the final bid. Fan added that the company was not allowed to release any further information about the buyer. The record selling price of US$467 per square inch beat the record of his last painting“Majesty,”which was auctioned off at the price of US$455 per square inch on May 28,according to a statement released by the Unique Art Collections International. Master Wan Ko Yee has received high recognition worldwide. Both the governments of the State of California and City of San Francisco have separately proclaimed March 8,2000 as‘Master Wan Ko Yee Day’because of his outstanding achievements in various fields. I have spent more than 60 years of my professional life in the field of painting. During the many decades of practice and experiences, I have come to know many famous painters. That is especially the case since I became the Head Consultant for authenticating paintings and calligraphy at the National Museum of China in Beijing. As an appraiser and authentication officer of paintings and calligraphy, the bulk of my work is to verify the authenticity of Eastern and Western paintings. I have reviewed tens of thousands of famous paintings, especially the rare and precious works of the maestro Vincent van Gogh of the Netherlands, and those of the champion of Eastern paintings, Qi Baishi of China. Both Van Gogh and Qi Baishi were great world-renowned masters in art. One represented the apex of Western art and the other was a master of an extreme class in the field of Eastern paintings. Both artists had drawn from the essence of the classical traditions of their respective cultures. They created new styles of art and new ways of seeing the universe. They broke new grounds and became pioneers of new eras, each becoming a creative guru of his time, developing a distinct style of his own and leading new trends that inspired later generations. Their works reflect the different essences of the Eastern and Western traditions. To what extent can their works influence the artistic civilization of the world? What kind of artistry did they achieve that made them upright monuments in art history and admired by so many people? Some art critics compared the works of Van Gogh and Qi Baishi to see which of them reached a higher level of accomplishment. They concluded that both have their own merit, both are undefeated champions in the art and both reached the pinnacle of artistry. Recently, some art critics also brought up the oil painting Sunflowers and the ink-wash painting Sunflowers, both created by H.H. 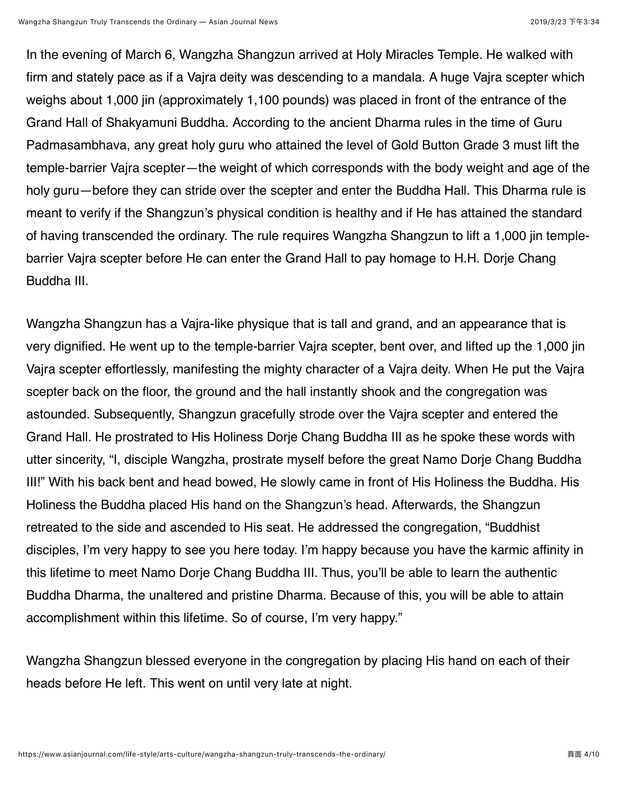 Dorje Chang Buddha III, and gave them rave reviews. They went on to compare the works by Vincent van Gogh and Qi Baishi with the works by H.H. Dorje Chang Buddha III, trying to establish which of the three artists is the champion of the champions. The result of comparing the works by Van Gogh, Qi Baishi and H.H Dorje Chang Buddha III is tremendously inspiring. Ever since the Renaissance, Western artists had placed emphases on rational analysis and the realist portrayal of forms. They used light, texture and details to present the realistic, three-dimensional perspective. A few centuries later, Van Gogh rejected the monotony of such use of light and shadow and the realistic portrayal of figures. He pioneered the movement of impressionism that suited him well by applying a mix of colorful, brilliant, splendid and vigorous brushstrokes. He became a great master of his time and his name was forever etched onto the monument of Western civilization and art. Whenever people think of Van Gogh, they think of his unique character, the sparkles in his eyes that emit lightning, his vigor and his incessant pursuit of inspiration in art without any regard to external hardships. Van Gogh was an artist by birth. He was of exceptional confidence and was somewhat neurotic. Having such traits, he pursued the art that he loved without any reservation or hesitation. He loved his works and regarded everything else with disdain. He preferred to be a loner in the world and did not care to make acquaintance of other painters of his time. His works are full of luminous colors, the brushstrokes are like rising winds and racing clouds in the sky. In his art, he depicted pasture, figures, flowers and other subject matters with brisk colors. Every brushstroke was transformed from his inner emotions. Such emotions were fully and colorfully captured in his Self-Portrait as well as in the transcendental Sunflowers that he painted. These works contain an animated spirit that is deeply moving. From Van Gogh’s artistic spirit and intent, we can detect that he was profoundly knowledgeable about Chinese ink-wash paintings. Precisely because of this, while depicting forms and applying colors, he employed the skills of using the center tip of the brush and parallel brushstrokes. His Still Life with Bible was created with parallel brushstrokes. In his Self-Portrait, he portrayed his face filled with lines and plaques that are extraordinary. It is not hard for us to discover that he drew inspirations from the substance and essence of Chinese painting in those brushstrokes. That is why Van Gogh is such a distinguished, unparalleled artist of his time and his works are superior to those by the other Western oil painters such as Cezanne, Gauguin or Picasso of the same era. Van Gogh’s artistic style was closely linked not only to Chinese civilization in the East, but also to the classical Renaissance art, Pointillism, German Expressionism, and Impressionism in the West. Toward the end of his life, he came into oneness with the universe and immersed himself in a carefree state of mind to “follow wherever nature might lead.” As such, he was no longer aware of his own existence. In his mind, there was only the art and the universe. “Following where the nature may lead” is the essence of the ideology of the Chinese philosopher Laozi. Van Gogh cut off his ear with a knife. He lost himself completely in painting. That was his unspoken resentment and rejection of the unfair treatment imposed on him by the society. Qi Baishi was profoundly knowledgeable about impressionist, fauvist, and realist paintings. By adopting the essence of Western painting and incorporating the traditional spirit of Eastern art, he developed his unique style and became the master of Chinese painting of the twentieth century. His brushstrokes were solid and poised, evincing a sense of power that went all the way through the paper. Using sheep-hair brushes, he elicited calligraphic skills to create his paintings. Qi Baishi’s lines are bold and robust, embodying a forceful spirit that can move mountains. At the same time, these lines are flexible, sturdy and round, with similar qualities to the lines of wire-drawing. His compositions emerged naturally from the spontaneous movement of the brushes. Such compositions are accompanied by vigorous calligraphy resembling the strength, power and fluidity of stone inscriptions. The artistic concept of spontaneously “following where nature may lead” is precisely derived from Laozi’s philosophy and the artistic civilization of the Chinese ethnicity. Qi Baishi favored the use of white space in his paintings. The white space in black-and-white Chinese ink-wash paintings is considered a solid color. Ink can be differentiated in nine shades (or five shades according to ancient Chinese text.) That is to say, the white of the paper per se and the black of the ink are all considered as colors. There is a sense of meticulous precision in the artworks by Qi Baishi. He depicted insects such as grasshoppers, mantises and butterflies in meticulous and vividly colorful ways. In some of his artworks, the artist was able to express his ideas by putting down just a few brushstrokes without any conscious intent, while arriving at a state of oblivion of his own existence. Anything depicted by his brushes was vivid and vibrant, with the subject matter coming alive on the paper. There is an aura that moves our heart and soul. All in all, Qi Baishi’s paintings were executed with a confident brushwork that naturally achieved a kind of childlike charm. Recently, some people compared the works by Van Gogh and Qi Baishi with the works by H.H. Dorje Chang Buddha III to see whose works are more superior and outstanding, or will have a broader and more far-reaching influence on later generations. I have viewed quite a lot of the artworks by Van Gogh, Qi Baishi and H.H. Dorje Chang Buddha III. I started the study and appreciation of the paintings by Qi Baishi under the enlightening guidance of my teacher when I was 9, and when I was 14, I began to study and appreciate the works by Van Gogh. It has since been several decades! At the same time, since I have admired the art of H.H. Dorje Chang Buddha III for a long time, to satisfy my desire and wishes I flew from New York to San Francisco to visit the International Art Museum of America, and to Los Angeles to visit the H.H. Dorje Chang Buddha III Cultural and Art Museum in order to see their collections. I was profoundly impressed by the architecture of both museums which is grand and dignified. Both museums have a collection of the authentic works by H.H. Dorje Chang Buddha III. There are various artworks that are created with different kinds of material. Some are bold and forthright, some are charmingly meticulous and astounding. The oeuvre is not made up of just one single style. Yet, the only artwork that was not available for viewing is the Sunflowers painted by H.H Dorje Chang Buddha III. When I hear that some art critics are comparing the works by Van Gogh and Qi Baishi with the works by H.H. Dorje Chang Buddha III, I naturally feel, from my experience of having studied the works by Van Gogh and Qi Baishi for a number of decades, that although their artistry are similar in levels, it is possible to say who is the best if we are just to compare the sunflowers painted by the three artists, when we include in the compositions, colors, brushwork, lines, vitality, spirit and so on. With all these elements in consideration, it is possible to do the comparison and conclude who painted the best, or in other words, whose works can bring the most joy and delight to people, or whose art will be most influential to the philosophy, artistic concept and entire civilization of this world. Therefore, without any ambiguity, we concluded. In terms of character and morality, Van Gogh would be the last of the three. In terms of level of skills, Qi Baishi would also be ahead of Van Gogh, who is, however, already the cream of the crop in western civilization. 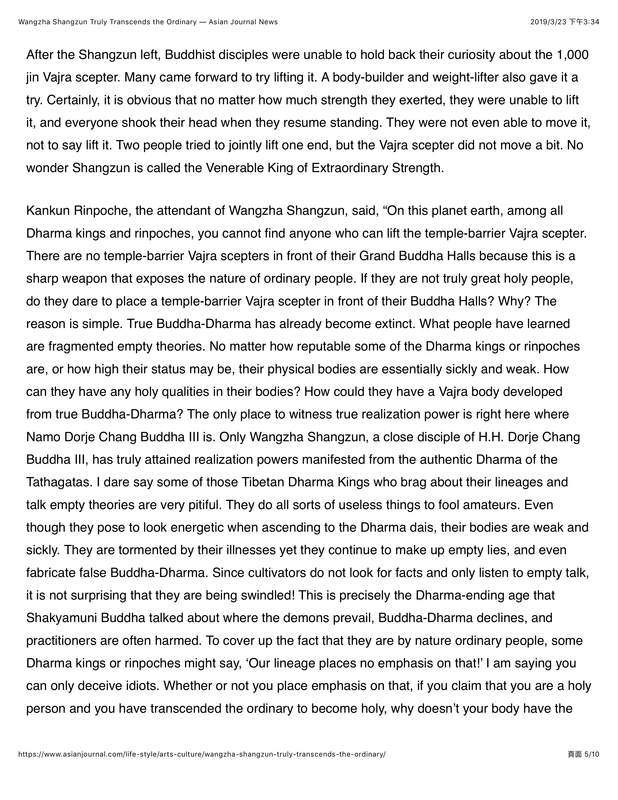 Being the Buddha living in the current century, H.H. 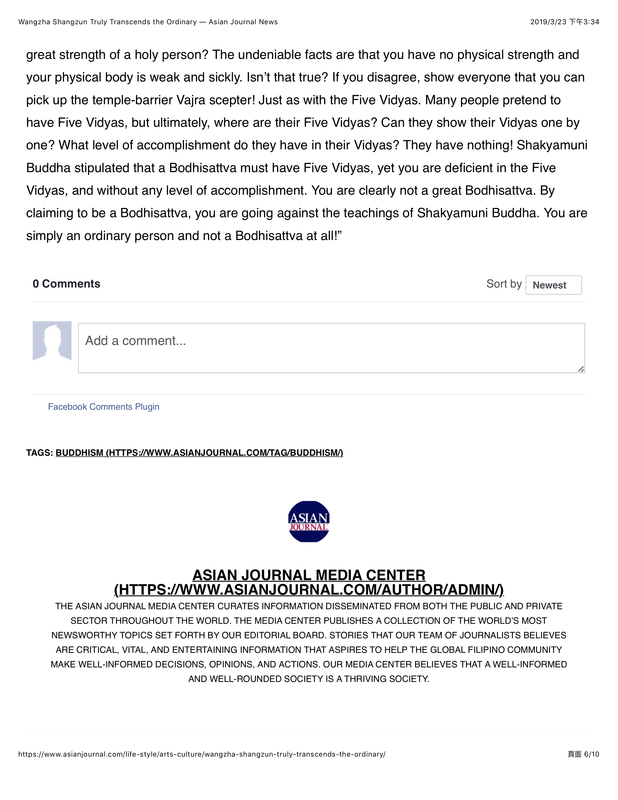 Dorje Chang Buddha III saves living beings with great loving compassion. He is not embodied in an ordinary being. Needless to say, the level of cultivation of the Buddha is superior to that of Van Gogh and Qi Baishi. In terms of creativity and painting skills, how can any ordinary being even hold a candle to the Buddha? In this way, the comparison result is immediately determined. When those art critics carried out the detailed research of the Sunflowers by Van Gogh and Qi Baishi as well as H.H. Dorje Chang Buddha III, they copied the artworks by all three artists. After copying the works by Van Gogh and Qi Baishi, they felt deeply that through hands-on practice, they indeed gained more understanding of their works. It would not be easy but not so difficult either for one to really reach their artistic level. As for the Sunflowers by H.H. Dorje Chang Buddha III, they found it rather difficult to copy. Even though they tried many times, they had a hard time just copying the form, let alone the spirit. The Sunflowers by H.H. Dorje Chang Buddha III clearly show the artist’s solid foundation and prolific skills in the Eastern and Western painting traditions. They comprise the essences in both traditions and display a brushwork, sentiment and colors that are one of a kind. The color tones and brushstrokes are rich, dense, soothing and elegant. Lively brushwork paints an animated charm that is whole, evincing a miraculous and expansive spirit and aura as well as a strong vitality. As for the Sunflowers oil painting in which H.H. Dorje Chang Buddha III depicted some flowers inside a vase, the artistry is extraordinary and full of variations; the composition is simple yet abstruse. The flowers are natural and gracious, such that they give an impression of unpredictability, reaching a state of oneness with the universe and emanating a sharp animated spirit. The ink-wash painting Sunflowers by H.H. Dorje Chang Buddha III has an uninhibited, natural, and spontaneous brushwork that is dense, bold, and robust, but also elegant and agile. It exhibits a charm that is like stone and bronze inscriptions. Overall, the whole painting manifests a harmonious and moving imagery, naturally emanating a lively vivaciousness and a carefree, spirited aura. In comparing the works by Van Gogh of the Western civilization, Qi Baishi of the Eastern culture, and H.H. Dorje Chang Buddha III, we can see the artists are distinguished in their unique own ways owing to their different cultures. However, only the artist who can continue to influence the world two to three hundred years from now will be the everlasting monument. There is a saying, “Talents emerge in every era and they all will each have 500 years of fame!” For people of the present day, the one whose work you like the best would be the one that is the most extraordinary! On Feb. 10th，2004 at the office of British Council in Washington DC Royal Academy Of Arts awarded Fellowship to Master Wan Ko Yee“H.H. Dorje Chang Buddha III.”. Master Yee is a world famous artist,a great Chinese painting artist, and the founder of Yun sculptures which are beyond natural beauty. The award of fellowship certificate and medal further confirmed Master’s extraordinary contribution to art of the whole world. Royal Academy of Arts was founded by King George Ⅲin 1768.Up to now it has more than two hundred years history.It is a world famous art institute. Many seasoned artists wish to pursue advenced study at this Academy.But this Academy admits only twenty extraordinary artists each year from all over the world to take courses for three years. Professor Phillip King,President of Royal Academy Of Arts,announced during the award ceremony: Royal Academy Of Arts has a profound history. Today we are honored toaward fellowship to the great artist and spiritual leader，Master Wan Ko Yee“H.H. Dorje Chang Buddha III.”. This is avery important and honorable event of our Academy in the past more than two hundred years since our establishment. Therefore Master Wan Ko Yee is the extraordinary art figure that we have been searching in more than two hundred years since our establishment and could not find until today. This is tremendous blessing of Roayl Academy Of Arts. our Academy has one hundred Royal Academicians,but there was no one who in the past more than two hundred years was awarded the above mentioned Fellow. This noble position is awarded to only the most distinguished artist in the world. Sir David Manning,Ambassador of United Kingdom to the United States, accompanied by Professor Phillip King and Professor Brendan Neiland,Keeper of Royal Academy Of Arts,met with Master Wan Ko Yee“H.H. Dorje Chang Buddha III.” and hiswife Professor Yuhua Wang.Sir David Manning showed his respect for the achievement of Master Wan Ko Yee and congratulated him for receiving such an honor.Mr.Andy Mackay,Director of Culture Department,The British Embassy attended the award ceremony today.